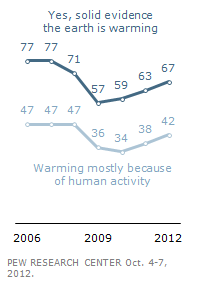 What proportion of Americans say there is solid evidence that the earth is warming? Is it: a) one quarter; b) one third; c) a half; or d) two thirds. What has happened to that figure over the last four years? Has it: a) fallen every year; b) stayed about the same; c) risen every year. Agreement in the US that the earth is warming is now higher than it’s been at any time since 2008. The research was conducted before Hurricane Sandy, so is probably higher now. Sure, still only about half say it’s because of human activities – though that has also increased by a quarter over the last three years. Everyone I speak to about climate change seems to think this. But, purely in terms of public opinion about climate change, I can’t find any evidence to support it. In fact, as I showed last year, concern about climate change in the UK is certainly not falling, and is probably increasing. The polling is less extensive than it is in America, but I don’t know of a single poll that shows that the UK public are currently becoming more sceptical about climate change. The general pattern is instead that there was a one-off increase in doubts around late ’09 , which has been followed by a recovery over the years since then. Again, lots of people still express doubts about climate change*. But the trend is of scepticism falling, not of it increasing. Of course there are still prominent people in the media who challenge the science, as the misrepresentation of the Met Office’s revision of its decadal projections showed. There’s a debate to be had about whether the media is becoming more doubtful of climate science, though again I suspect the opposite has been true over the last couple of years. * For what it’s worth, I don’t think this ‘do you believe in climate change’ question is particularly helpful, because it’s interpreted in a more political sense than is obvious. Most people who say they don’t believe in climate change still want the government to take action to stop it. This entry was posted on Monday, January 14th, 2013 at 21:02	and is filed under Climate Sock. You can follow any responses to this entry through the RSS 2.0 feed. Both comments and pings are currently closed. “A growing number of people in the UK do not trust climate scientists to tell the truth about climate change. This is one of many startling findings from a report published today (28th September 2012) by the Living With Environmental Change Partnership. The decline in trust of scientists (and indeed of all sources of information) is measured between 2009 and 2011. I don’t think the study actually tracks belief in the seriousness of climate change over a five-year period (despite the press release!) but it does track belief that the climate is changing, over a five-year period. What both of those show, which is exactly what I’m saying in the article above, is that stated worries about climate change, and belief that the climate is changing, dropped in the years up to the end of 2009/start of 2010, and have then remained about constant (or, in some polls, increased again).